This article is reproduced from Exponential Investor; a commercial website that has no connection with the British Gazette. In the final days of the summer of 1349, the inhabitants of London witnessed an extraordinary event. A contingent of roughly 600 men had travelled to the city from the low countries across the Channel: mostly from Flanders, Zeeland and Holland. Twice a day they would perform a strange ritual, often outside of St Paul’s Cathedral and sometimes while walking the streets of the medieval city. This would happen twice a day. 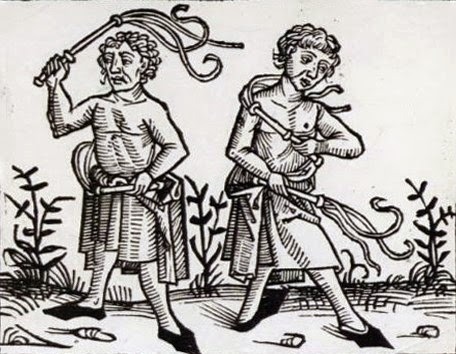 The men were known as the Brotherhood of Flagellants. The reason for such strange behaviour was, with the benefit of nearly 700 years of hindsight, more understandable than is first obvious. In 1349 Europe was being torn apart by the Black Death. It is hard for us today to understand just how devastating the plague was for medieval society. Historians believe something between 25% and 40% of the European population died. Millions more would have been physically, psychologically, socially or economically impaired by the plague. It lead to the virtual collapse of the medieval economy and pushed the social fabric to breaking point. Movements such as the Brotherhood of Flagellants arose as an explanation for death on such a monumental scale. It was thought that the plague was a message from God: a punishment for the sins of the people. The brotherhood sought to do its penance in response. It was as good an explanation as any other. People lacked the power to prevent the plague as it swept across the continent, so they looked to all-powerful God. That wasn’t the only theory people had. Large numbers of Christians blamed the Jews for the Black Death, often going on barbarically murderous rampages and burning entire populations of Jewish people. For instance, in August 1349, the Jewish communities of Mainz and Cologne were exterminated. By 1351, a total of 60 major and 150 smaller Jewish communities had been wiped out. It didn’t stop people dying of the plague, of course. The disease kept killing people: men and women, people of all ages, social standings and religions. People also looked to the sky for answers – literally. Scholars at the University of Paris believed the plague had been created by “a triple conjunction of Saturn, Jupiter and Mars in the 40th degree of Aquarius, occurring on the 20th of March 1345”. That’s a highly specific prediction. It was wrong. And it didn’t help. We now know, of course, that the plague was caused by the Yersinia pestis bacterium, which was carried by the fleas that travelled on rats. It was most likely first seen in Mongolia and carried to Europe in the wake of the Mongol invasions. The Black Death owed more to Genghis Khan than God, the stars or the Jews. But what’s interesting – and what is especially pertinent to us today – is people’s responses to the disaster. Virtually every explanation involved an external force: we blamed it on someone or something else. Some powerful, mystical and magical force that we couldn’t hope to understand or control. Fast forward to today. We now at least understand how most common deadly diseases work. We can do something about many of them. And many diseases that were a blight on humanity for centuries, like smallpox, have been utterly defeated by our ingenuity. If a new and deadly disease arises we don’t blame God or the supernatural. We blame ourselves. We don’t self-flagellate, we form a committee and ask ourselves what more we could have done. We accept that the ultimate power to save ourselves from disease, famine and pestilence lies inside our own brains. We’ve turned from blaming the external force to relying on the internal power of our own ingenuity. And that power is growing in new and radical ways. In fact our ability to reshape the world around us is actually accelerating, due to the rapid advancement of technology. I started this letter by talking about the Black Death. As diseases go, it was a terrible one: killing vast numbers of people in a very short period of time. But it’s not the worst disease humanity has ever faced. In terms of sheer number of people killed, malaria is far worse. According to Rosemary Drisdelle, author of Parasites: Tales of Humanity’s Most Unwelcome Guests, malaria could have accounted for – on average – more than five million deaths a year for thousands of years. In that context malaria is a much more serious threat to human life than the Black Death ever was. But I’ve never seen a Brotherhood of Flagellants seeking to do penance in response to malaria. Instead, we’re fighting the disease. Firstly with drugs. But also with much more powerful techniques. Gene editing technology enables us to edit the genes of mosquitos so that their offspring become sterile. Sterile offspring could mean no more mosquitos. No more mosquitos could mean the end of malaria. That’s the complete opposite of blaming the supernatural. In fact it’s almost a supernatural power itself: the power to rewrite the laws of nature to make the world the way we want it to be. It’s a project that has some serious backing. Bill Gates himself has invested millions in an effort to “engineer” certain types of mosquitos into extinction. The project is known at Target Malaria. The research is designed to develop a “gene drive” that will genetically sterilise mosquito populations that are responsible for the proliferation of malaria. And it seems to be succeeding. At least, if Gates’s investments are anything to go by it is. Earlier this year he upped his investment by $35 million, raising the total amount he’s invested to $75 million. That’s the largest investment ever made in the technology. No generation before ours has had this ability. And using it to fight disease and save lives seems a good way of using it. But it’s fraught with moral ambiguity – especially when we’re using it to wipe whole species out. It’s a theme that you’ll see recurring all week as part of this special series: mankind pushing the frontier of what is possible, challenging the powers once ascribed to the supernatural or the gods, and taking control of our own destiny. This is possibly the greatest undertaking in human history. This week (on my website) I’ll show you why that is, why it matters and why it could lead not only to radical change, but revolutionary wealth.